While I’m not a vegetarian, meat doesn’t play a very central role in my diet. Usually at least. There’s something about the late autumn and winter that brings out the inner carnivore. When the colder weather sets in, there’s nothing better than a good pot roast. We’ve featured brasato, the northern Italian style of pot roasting, before. But this version, brasato ai funghi, is made extra special by dried porcini mushrooms, which infuse it with their intensely woodsy flavor. A brasato is not at all hard to make, although a proper one involves a quite few steps: marinating, larding, browning and braising. You can skip the first two if you’re in a hurry. But the pay off is well worth the effort. A well made brasato one of the most delicious, warming and comforting dishes imaginable, perfect for this time of year, especially served with mashed potatoes or polenta. If marinading your roast, place it in a bowl or container with the marinade ingredients and enough red wine to just cover. Leave overnight (and up to 24 hours) in the fridge. Turn the roast over once or twice as it marinates. Take the beef out of the fridge about an hour before you want to cook so it returns to room temperature. Pat dry. Make a battuto by finely mincing the onion, carrot and celery together, either with a sharp knife or mezzaluna on a cutting board, or in a food processor, until the mixture has almost turned into a paste. Melt a good knob of butter, along with a drizzle of vegetable oil, in a Dutch oven large enough to hold the roast, then add the battuto and gently sweat all the ingredients, with a pinch of salt, until they are very soft. Take care not to brown the aromatic vegetables—a few drops of water will help them prevent browning and help soften them as well. Raise the heat and add the roast, browning it on all sides, again taking care not to burn the aromatics. Pour a ladleful of red wine (or the strained marinade if you’ve done that) over the roast and let it simmer, turning the roast now and then. When the wine is almost evaporated, add the broth or water, along with the soaked mushrooms. (If you’re not making the mushroom garnish, you can add some or all of the soaking liquid, strained of any grit, as well.) Cover and let the roast braise over low heat until tender. (Times can vary, but 2-3 hours should be enough, although some recipes call for 4-6 hours of braising.) Adjust the heat so that the braising liquid simmers gently. Add more liquid (broth, water or mushroom water) if things get too dry. While the roast is braising, cut the fresh mushrooms into slices or quarters. Sauté them briskly in a good knob of butter and a drizzle of vegetable oil. They will exude their juices at first, once they have evaporated, you will hear them begin to sizzle. At that point, they will begin to brown. If you are using rather bland mushrooms, you can add some or all of the soaking liquid from the dried porcini to the mushrooms, just as they begin to sizzle, and let it evaporate. When the beef is tender, remove it from the pot and let it rest for a few minutes. Meanwhile, check the braising liquid, which you will use as your sauce. It should be dark and intensely flavored, abundant but not too thin. Boil it down if it’s too thin, and add water if need be to thin it out. The battuto should have completely melted into the sauce; if not, you can purée the sauce with a hand blender. If you’re using the mushroom garnish, you can add it to the sauce if you like and let it simmer for a few minutes. Slice the roast on a serving platter and add the mushroom garnish all around it. Nap with some of the sauce. Place the rest of the sauce in a sauce boat for those who want more. Brasato is wonderful accompanied by mashed potatoes or soft polenta. A brasato is not at all difficult to make although as we’ve seen, it does involve quite a few steps. You can simplify things by skipping the initial marinating and larding, of course, and skipping the garnish if you like. And you can speed things up considerably if you use a pressure cooker for the braising: 40 minutes at high pressure, followed by a natural release, which might take say 10-15 minutes, will get the job done. Use less liquid—about half the amount called for in the recipe—and you should be good to go. You may need to reduce the sauce a bit, as pressure cooking virtually eliminates evaporation. Or you could thicken the sauce with a bit of corn or potato starch. This quick method should mean your brasato can be finished in a bit over an hour. What you want for a good brasato—or any pot roast—is one of the tougher cuts of meat with plenty of fat and connective tissue that will break down during the long, slow braising process, enriching the meat as it cooks. These generally correspond to cuts from the neck, shoulder or rear of the cow. Comparing cuts of meat across cuisines is a confusing business, but many Italian recipes for brasato call for scamone (rump roast), tenerone (a cut from the neck) or capello di prete or priest’s hat (roughly corresponding to part of what we call the chuck). As I’ve noted before, I particularly like chuck for pot roasting. Although it does not produce a very pretty roast, with its ample marbling, chuck stays moist and juicy without larding. Among the other cuts commonly used for pot roasting here in the US, the bottom round is another good cut. And for today’s post, I used the eye round which makes a neat presentation when sliced. It is fairly lean so benefits from marinating and larding. Personally, I find the top and center round too lean for pot roasting, but again, marinating and larding helps them stay moist. Speaking of larding, the technique here is pretty basic, aimed at the home cook without fancy skills or special equipment. But if you want to attempt a more professional larding job, check out our past on stracotto all fiorentina, where you lard pancetta and carrot the whole length of the roast with a larding needle. As for the mushrooms, porcini would be the classic choice in Italy, of course. Where I live I can’t find fresh porcini for love or money, so I turn to other varieties like Baby Bellas and use the soaking liquid from the dried porcini to infuse them with their musky flavor. (An old trick I learned years ago, so long ago in fact that I can’t remember where, but it does work. ) But otherwise just about any varietal of mushroom that you like and can find would do quite fine. If time allows, the brasato will be even better served the next day. Let it rest in its braising liquid, then gently reheat it when you’re ready to eat. Meanwhile, prepare the mushroom garnish and proceed with the last two steps in the recipe. Another particularly tasty (if not very photogenic) way to make the dish ahead, or to enjoy leftover sliced brasato: Lay slices of the meat on a baking dish, cover the slice with the mushroom garnish, then cover it all with the sauce. Place the baking dish in a hot oven (200C/400F) for 10-15 minutes, until the meat is heated through and the sauce simmering. Serve right away. The mushroom garnish is optional. You can simply use the dried porcini, adding their soaking liquid to the pot, and you’ll get a lovely mushroom flavor. And if you’re lucky enough to have fresh porcini on hand, you can do without the dried. Just add sliced porcini to the pot say about 30 minutes before you’re done. The same technique can be also used to make a plain brasato. Just omit the dried porcini and, of course, the mushroom garnish. Add some sautéed or braised baby onions—or sliced yellow onions— towards the end instead of the mushroom garnish and you’ll have a very nice brasato con le cipolle. Raise the heat and add the roast, browning it on all sides, again taking care not to burn the aromatics. Pour a ladleful of red wine (or the strained marinade if you've done that) over the roast and let it simmer, turning the roast now and then. When the wine is almost evaporated, add the broth or water, along with the soaked mushrooms. (If you're not making the mushroom garnish, you can add some or all of the soaking liquid, strained of any grit, as well.) Cover and let the roast braise over low heat until tender. (Times can vary, but 2-3 hours should be enough, although some recipes call for 4-6 hours of braising.) Adjust the heat so that the braising liquid simmers gently. Add more liquid (broth, water or mushroom water) if things get too dry. When the beef is tender, remove it from the pot and let it rest for a few minutes. Meanwhile, check the braising liquid, which you will use as your sauce. It should be dark and intensely flavored, abundant but not too thin. Boil it down if it's too thin, and add water if need be to thin it out. The battuto should have completely melted into the sauce; if not, you can purée the sauce with a hand blender. If you're using the mushroom garnish, you can add it to the sauce if you like and let it simmer for a few minutes. Don’t do pot roast often, but love it. Mushrooms and red wine are such a wonderful flavor combo — and they work so well with beef. Chuck roast for me, too — you’re right that it’s not the prettiest cut, but certainly the best tasting for pot roast. Really cold here at the moment, so this is SO appealing! Nothing like the cold weather to bring out your appetite, eh? Scrumptious is the word that first comes to mind, Frank! You’ve reminded me that I need to go buy a nice piece of pork to make porchetta! Thanks! 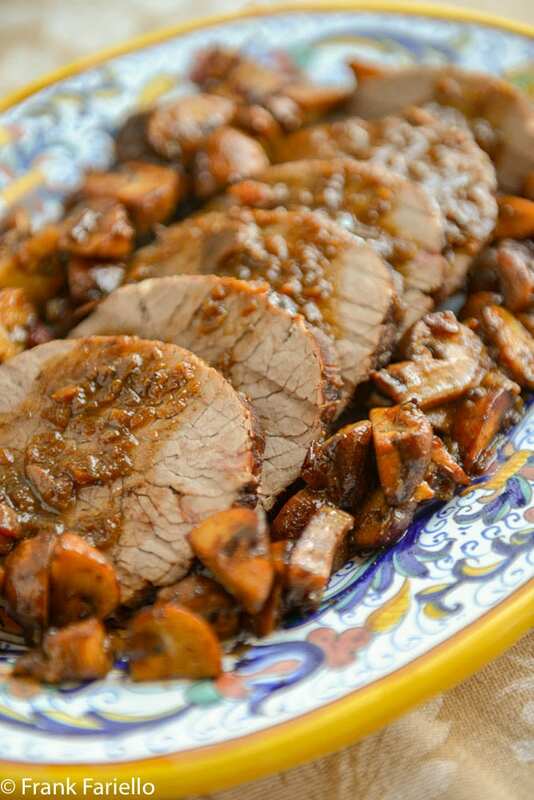 Brasato is such a classic dish and it is wonderful with mushrooms. What a great dish and beautiful photography as always. Your pot roast looks so amazing. The sauce looks wonderful. I’ve never made a pot roast from eye of round, but I agree with you that it makes a wonderful presentation. I haven’t made a pot roast in ages – I really need to make one! We have already had a deep chill and when that happens, my mind goes to pot roast. I make it about three times every winter. I love anything to do with mushrooms, so the recipe is printed and ready to go. Plus, I am a sucker for a gorgeous roast. This would be right up your alley, then, Claudia! Thanks for stopping by. Love a good roast and this one looks wonderful. Mushrooms and fall go so well together and paire with your brasato perfectly. Then served with soft polenta, I’m thinking one happy tummy. How do you think it would work with pork? I say why not? I imagine a pork shoulder roast would be as good or perhaps even better. Holy cow! I finished making this tonight for dinner and what a treat! This is well worth the effort and time. I used a chuck roast so it wasn’t as pretty as yours, but the sauce! Rich and luxurious. That’s fantastic, Karl. So glad you enjoy it. Wow, Frank, this looks fabulous. I have just lucked out and been given a box full of fresh porcini, so this is definitely on my to-do list. Thanks! Linda. I don’t know if I’d have the patience to do the larding, but your roast looks so delicious, Frank. I haven’t cooked a round roast in ages, but you’re giving me incentive to try again. Definitely worth the effort in my book, Linda, especially this time of year. Like everyone else, I think this looks fantastic. We’re just getting into some cooler weather in Tucson, so this is good timing. Like you, I prefer a chuck roast… No, it’s not as pretty, but the flavor is amazing! I’ll give it a shot and let you know. This is exactly the type of meal we are craving these cold days as well. The porcini definitely amps up the anti, but you must be a mushroom lover, which we are. Great tips on the meat cuts as well. This looks like a wonderful weekend dish. I think it is, Eva. Thanks for your comment! And thank you for stopping by, Paola! This brasato sounds delicious, Frank! I find it interesting comparing meat cuts across countries/cultures. Some of the cuts that are common in Italy aren’t available here in the US and likewise. But as you pointed out in the post, there is some flexibility to which roast to select. The mushrooms are an excellent addition, and this sounds like a delicious meal for a cold winter day! Speaking of cold days, I actually don’t mind tackling a recipe with multiple steps on these days…it just comes with the season. Indeed it does, David. There are some consolations to the cold weather, aren’t they? I too crave meals with meat like this one when the days & nights become cooler. Those mushrooms look so beautifully caramelized! I just might make this one very soon, as I know my family would love it! I love reading your posts!! I learn so much from them. I left Italy way to young to have learned anything about the cuisine there. Mamma just made all of her delicious Northern dishes but didn’t relate the whys. Hubby and I are planning to make the Brasato ai Funghi — we’d love to share it with our readers and of course, give you the credit (if it’s okay with you). We’d like to try the professional way of larding — Hubby loves a challenge. Anyway, do you do the larding before marinating? I think we’d do it that way – less of a mess and the carrot and pancetta would benefit from marinade. Any feedback would be welcome. Sure, of course! I’d be honored. In terms of larding, I don’t imagine it makes too much of a difference whether you lard before or after marinating. I’ve done it both ways, depending on my time constraints or mood. Tho’ an omnivore roasts do not oft grace my table beef arriving there blue or rare or then in multitudinous Asian guises. Like your recipe the beginning part of the prep reminding me of childhood days of making sauerbraten. Both rump and round roasts are popular in Australia and Swiss Browns methinks would fill the mushroom part adequately. Definitely worth a try, Eha. Thanks for stopping by! Ha! Well, maybe I was. 😉 I certainly used to dream about having a trattoria in my younger days, and have wondered whether I shouldn’t have “followed my bliss”. This blog has been the next best thing. But anyway, thanks for the kind words! Oven braising really is great. Besides heat control, there is something different about the result I find very appealing, though I’d be hard-pressed to put it in words. (This time I made this the easy way, with a pressure cooker. That’s almost going in the opposite direction from a gentle oven braise, but I do like the results—and the speed, of course. If there are several options to choose while preparing food, I always go for a slow ride, especially if there is a group of enthusiasts with me so we easily split the jobs to enjoy afterwards. Brasato ai funghi is definitely meant for such occasions. Thank you Frank and enjoy the rest of weekend !